We are prominent business entity engaged in manufacturing and supplying an impeccable range of Industrial Chains that are widely used in various industries such as fertilizer plant machinery packaging and sugar mill industries. Manufactured using superior quality raw material procured from the reliable vendors of the market, these products are highly appreciated by the clients for their corrosion resistance, excellent quality and superior finish. IN addition to this, we facilitate in providing customization as per the exact specifications laid down by the customers. We have gained expertise in delivering a quality-assured range of Slat Band Chains. These chains are fabricated under the surveillance of our professionals using mild and stainless steel. The offered slat band chains find their extensive applications in food processing, chemical, and pharmaceutical industries. Moreover, our offered band chains these chains are widely appreciated in the market for their features such as excellent dielectric strength and resistance to corrosion. 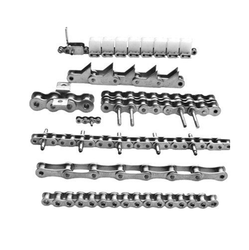 In order to fulfill the changing demands of our clients, we are offering a quality range of Attachment Chains. The offered chains are widely applauded in the market for their features like high tensile strength and strong construction. Moreover, we offer these chains for use in plastic and food processing industries. Our professionals ensure that only defect-free range is delivered at the customers' end within the stipulated time-frame. Our enterprise is counted among the most reliable manufacturers, exporters, and wholesalers of Standardized Precision Roller Chains. Designed and developed by the professionals using advanced technologies and quality raw material, these are widely acknowledged in the market for their excellent dielectric strength and resistance against corrosion properties. 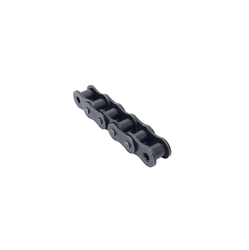 Moreover, we offer these roller chains to the clients in 3/16 "pitch to 3. 5" pitch as per their needs. All our offered products conform their adherence with BSA/ASA standards. Further, these precision-engineered roller chains find their extensive usage for heavy-duty applications in various industries. These roller chains comprise series of journal bearings held in precise relationship to each other with assistance of constraining link plates. With our expertise in this domain, we are able to offer a superior quality range of Precision Roller Chains. 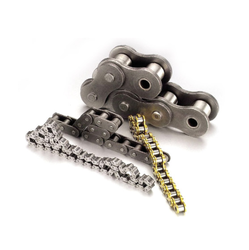 We offer our range of roller chains in 3/16" pitch to 3.5" pitch as per BSA/ASA standards. These easy to operate roller chains find their extensive applications in cement, mining/minerals/heavy conveying, construction, hydro-electric, paper mills wastewater, sugar, steel mills, food and general conveying/elevating. Moreover, we offer our range in various sizes, shapes & designs along with different technical specifications in order to meet the needs of patrons.